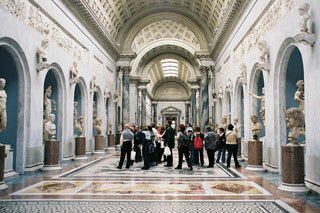 The Vatican Museums are Christian and art museums located within the city boundaries of the Vatican City. They display works from the immense collection built up by the Popes throughout the centuries including some of the most renowned classical sculptures and most important masterpieces of Renaissance art in the world. The museums contain roughly 70,000 works, of which 20,000 are on display, and currently employ 640 people who work in 40 different administrative, scholarly, and restoration departments. This article uses material from the Wikipedia article "Vatican Museums", which is released under the Creative Commons Attribution-Share-Alike 3.0 License.